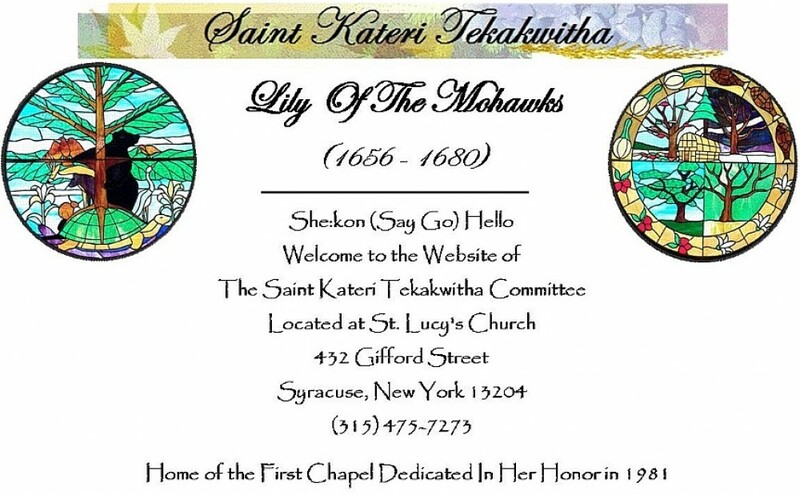 Right around the first Saturday of November, following All Souls Day, the Saint Kateri Tekakwitha Committee of St. Lucy’s Church schedules the annual Fallen Leaves Mass and Feast with a Native American Liturgy. The tree in the picture was once a living tree barren of leaves. One by one, the leaves were placed on the tree transforming it into a beautiful blaze of autumn colors. Each leaf bears the name or a small picture of a family member, friend or loved one who has passed away. A donation of $1.00 for each leaf name is appreciated however, it is not required. 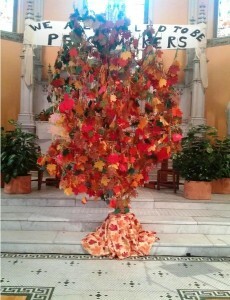 You do not have to be a Native American to have a leaf placed on the tree or to attend the Mass. Each name is also placed into a Memorial Booklet that is handed out with a copy of the Mass Booklet. This year, 2019, there are over 3000 names on the tree. Two and one half hours prior to the start of the Mass, each name is read to a soft drum beat. The Native American parts of the Mass are in Mohawk phonetics so that everyone can participate. At the beginning of the Mass, the tree is blessed with a pleasant smelling smoke from a mixture of Sweetgrass, Sage and Cedar. This smoke is fanned with feathers that carry our prayers to the Creator. After the Blessing of the Tree, the congregation is blessed in the same manner. Following the Mass, everyone is invited to join us in the basement of the Church for the Feast that is an extension of the Mass. We do not charge for the Feast, however, we do accept donations. The Feast usually consists of Turkey, Ham, Stuffing, Potatoes, Indian Hash, Corn, Beans, Squash, Baked Beans, Cranberries, Veggie Tray, Cheese Tray, Mohawk Corn Soup, Rolls, Cake, Coffee, Tea, & traditional strawberry drink. In the Iroquois tradition, any food or drink that is prepared for a Bereavement Feast cannot be tasted in the preparation. This does create a little bit of a challenge when adding seasonings, but over the years, we seem to have gotten the hang of it. We hope you can join us for this very special Liturgy. 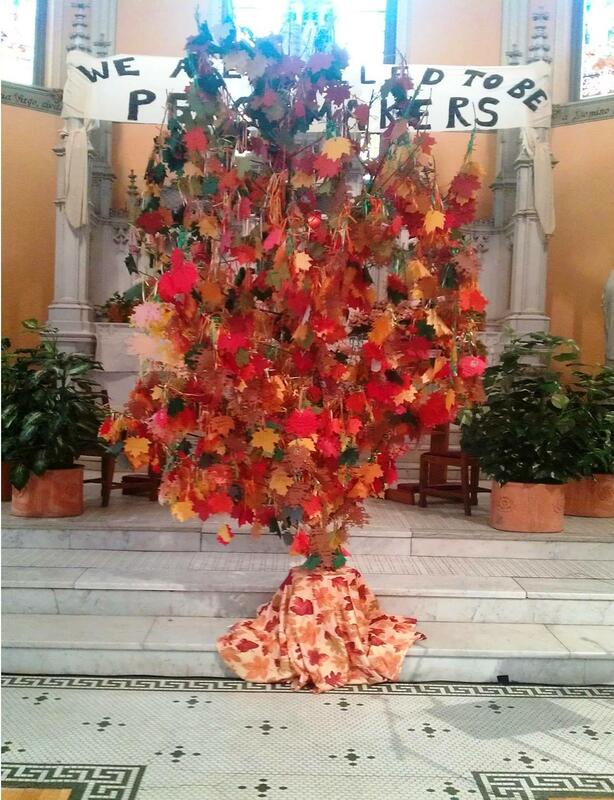 If you are unable to attend the Fallen Leaves Mass, but would like to have leaves placed on the tree and chanted prior to the Mass, please send your name(s) to Pat Whyland, 303 Melrose Avenue, Syracuse, NY 13219-1152 by the end of September. Please make sure you print the names clearly to ensure the correct spelling is placed on the leaf(s) and in the Memorial Booklet. If you are enclosing a donation, please use check or money order made payable to the St. Kateri Committee.